For the following Case Studies, I will use the blog commons as a repository for information about the people and places. After, I have listed some facts, I will write a “takeaway”. Eugene Bullard’s is extremely important to my study of the African American Exodus to France, because he was notably one of the African Americans that paved the way for other sojourners. He was born in “Columbus, Georgia”. However, his journey truly began when he was a teenager. As a teenager Bullard stowed away on a ship headed to Scotland. The reason for leaving: to escape racism. “Bullard arrived at Aberdeen before making his way south to Glasgow. He became a boxer in England and also worked in a music hall.” Bullard Fact. He died in New York City of stomach cancer on October 12, 1961 at age 66. Eugene Bullard was buried with military honors in the French War Veterans’ section of Flushing Cemetery in the New York City borough of Queens.” Fact. Eugene Bullard is extremely important to this study because he exemplifies the difference in the French and American perspectives. When learning about his story, I could not believe his transition from being a celebrated man in France to an elevator operator. During my various Black Paris history tours, Bullard was consistently mentioned as a staple in the Black Paris experience. I believe Bullard’s story is essential, because it introduced me to the non romantic Paris experience. When I chose this study, I was fascinated by the pièce de résistance of Paris. Even though, I am still searching for that characteristic, I believe Eugene Bullard’s story presented the reality and necessity of Paris because it helps my study get to the brass tax of the Exodus to Paris. The brass tax is that African Americans were fleeing racism and in order to do this, some African Americans followed the myth of Paris. Of which they created a reality of acceptance, appreciation, and great expectations that were previously not considered in their home country. Chivalette, William I. 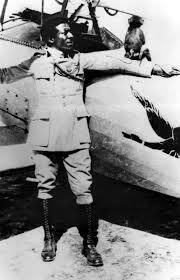 “Corporal Eugene Jacques Bullard First Black American Fighter Pilot.” Air & Space Power Journal. N.p., n.d. Web. 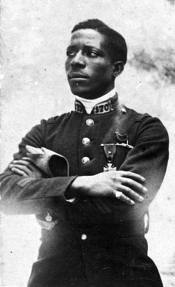 “Eugene Bullard.” Wikipedia. Wikimedia Foundation, 13 Aug. 2013. Web. 31 Aug. 2013. Garner, Carla W. “Bullard, Eugene Jacques (1894-1961) | The Black Past: Remembered and Reclaimed.” BlackPast.org. N.p., n.d. Web. 31 Aug. 2013. Note that he was “publicly acknowledged” by President-General Charles de Gaulle of France. This entry was posted in Week 2 on August 31, 2013 by Elizabeth-Burton Jones. I love to sing and dream big. I am an optimistic and energetic person that is ready to work.